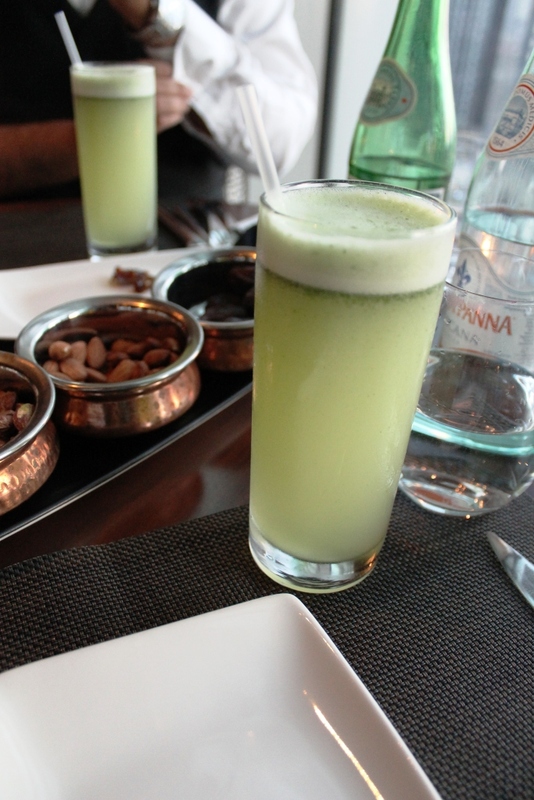 Mint Leaf Dubai unveils a selection of authentic Indian cuisine with an innovative contemporary twist that promises a truly exceptional gastronomic experience. 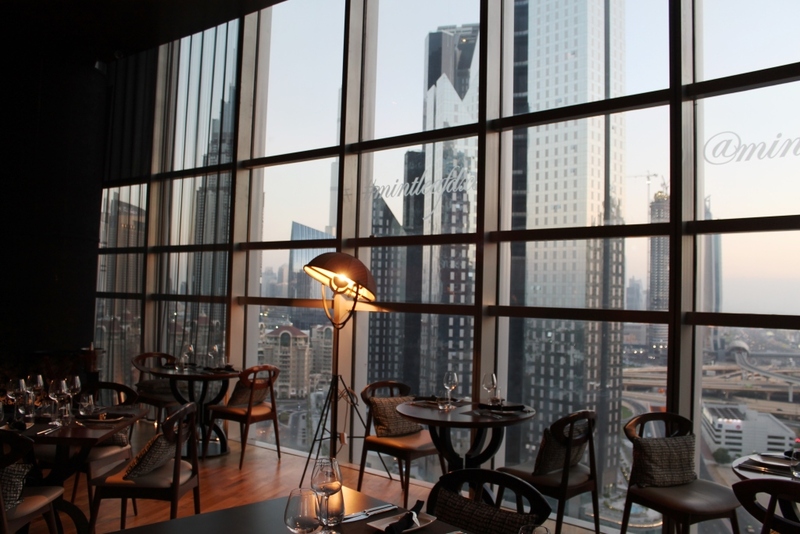 Located on the 15th floor of the Emirates Financial Tower in DIFC, Mint Leaf of London overlooks Downtown Dubai in all it’s glory. It is only the first of many surprises throughout the night that will leave your mouth agape. 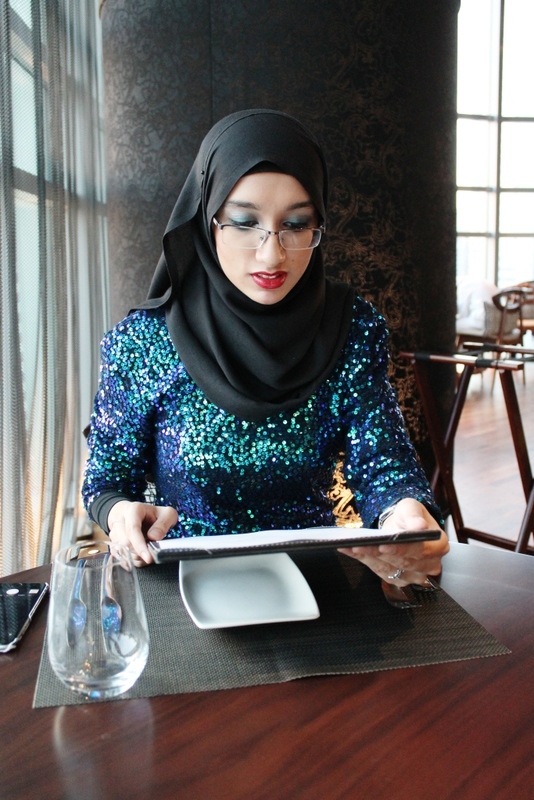 On Friday, I was invited to review their Iftar menu for the oncoming month of Ramadan. We chose to go just before sunset, and I am so glad we did, because witnessing day turn to night from this high up was truly breath taking. As we entered in to the restaurant, we were met with a bustling bar. Mr Z, Baby Z and myself were then ushered in and shown to our window seats within an open space of high ceilings and full length windows. The interior is chic and I adore the glowing lamps dotted around the edges of the restaurant. A candle was lit and we were ready for our gastronomic experience, though in some respect, it had already begun. After being handed the menu, it was explained that during Ramadan, there will be a plate of nuts and dates waiting at the table already for Muslims to break their fast with. 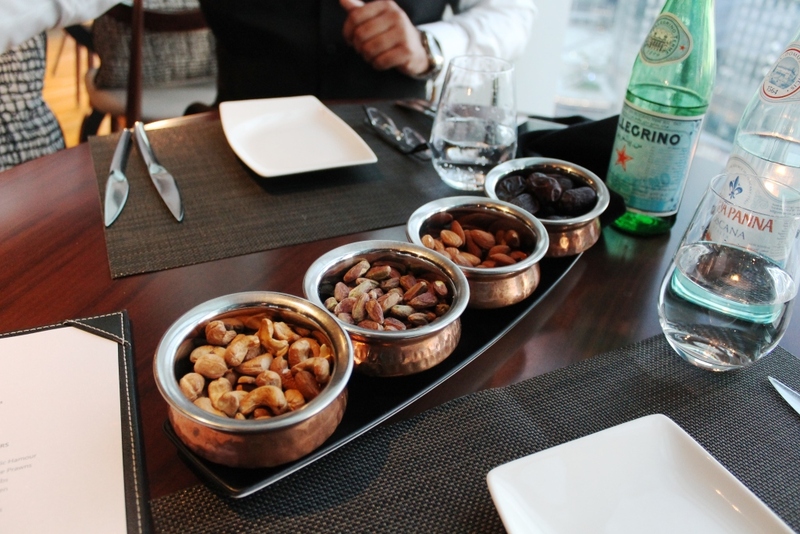 The plate we received included almonds, pistachios and cashew nuts, all of which were warm and earthy. Baby Z couldn’t dig his teeth into the dates quick enough. Next up were the drinks. 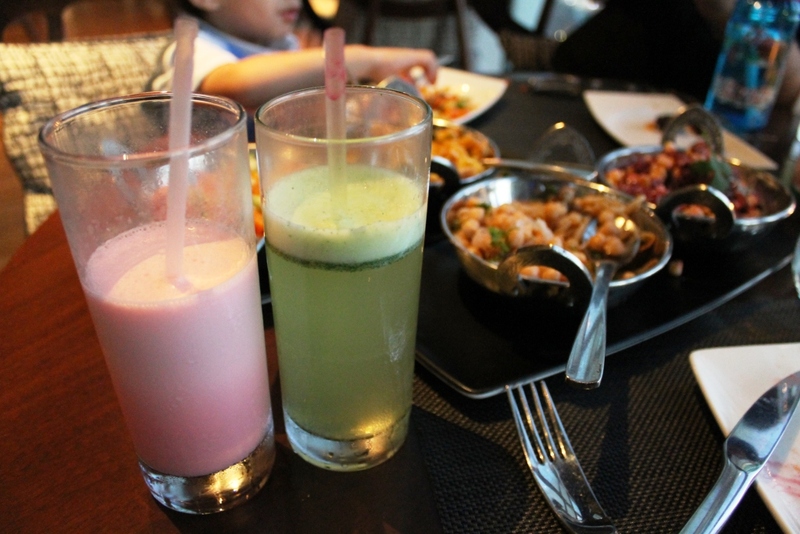 The Iftar Menu offers guests a choice between Mint Lemonade and Rooh Afza. Though the Mint Lemonade was refreshing too, I downed the Rooh Afza pretty quickly. Rooh Afza, for those that are unaware, includes ingredients with cooling properties such as Rose, and is traditionally used in many households (as well as my own) to break one’s fast. Therefore, this was such a treat and I feel it had the right amount of sweetness to compliment the nuts. Following this were the starters. 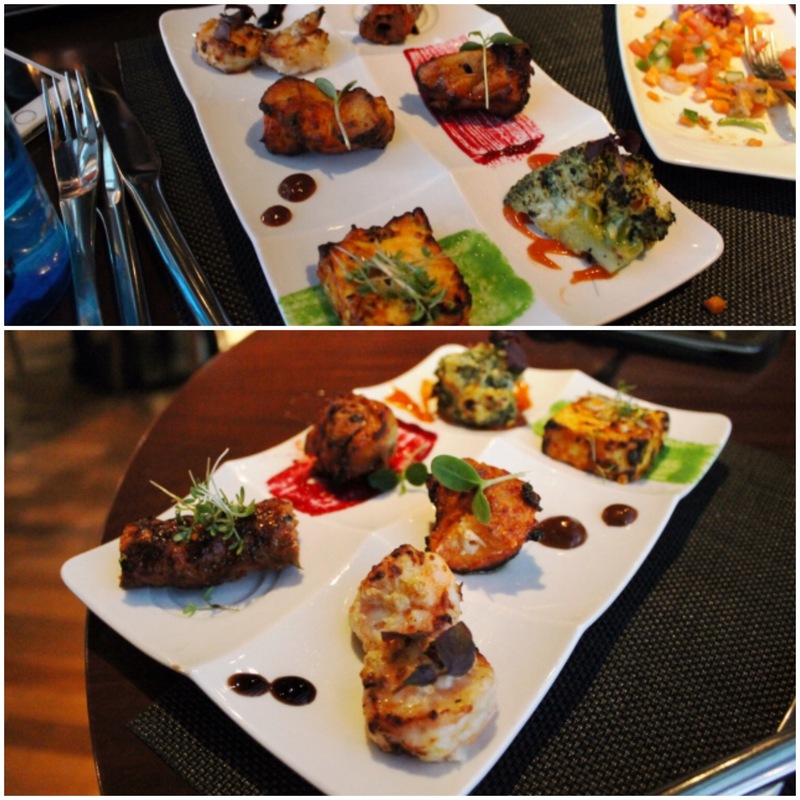 Mint Leaf will be offering guests a range of Cold and Hot Appetizers to choose from. 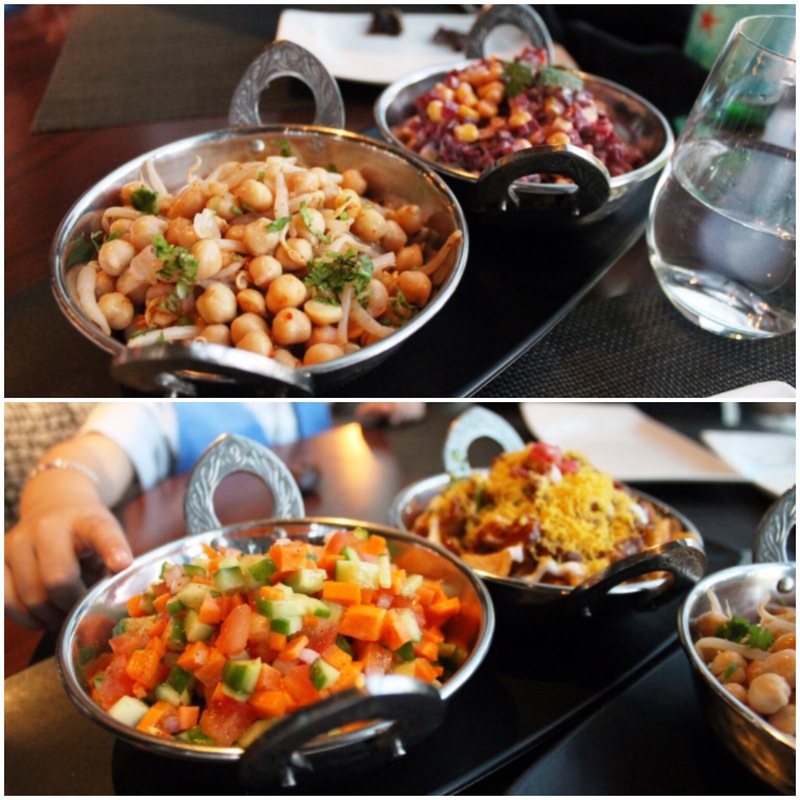 The Cold Appetizers include Sprout Beans & Chickpeas Chaat, Kuchumber Salad, Beetroot & Corn Summer Salad and Papdi Sev Chaat. It was the first time I had tasted the combination of sprout beans and chickpeas together, and it was surprisingly good! The chefs at Mint Leaf want to offer guests a menu that is healthy, and therefore included ingredients such as sprout beans and beetroot. I enjoyed the crunch of papdi in the Papdi & Sev Chaat. Personally, I found the chaat masala in the Kuchumber Salad a little over powering, probably because I have a sweet tooth, and so understandably my favourite cold appetizer was the refreshing and sweet Beetroot & Corn Salad. Next up came the Hot Appetizers which included Roast Fennel Seed & Garlic Hamour, Cardamom & Cream Cheese Prawns, Australian Lamb Kebabs, Lahori Tandoori Chicken, Achaari Paneer Tikka and Saffron Broccoli Florets. It was apparent that a lot of care had gone into making these dishes, and let me tell you, those prawns were incredible. I think I may need to go back just to order a plate of those Cardamom and Cream Cheese Prawns. Most of the other hot appetizers I found to be quite spicy, apart from the Paneer Tikka which was so soft, it practically melted in my mouth. If you can handle the heat, I am sure you would love the Broccoli Florets, the taste of which was like nothing I had tasted before. After a short break, we signaled that we were ready for the Mains. The Iftar Menu Mains will include the following: Saag Gosht (Australian Lamb Leg braised with Spinach and Garlic Puree), Chicken Tikka Korma (Mildly Spiced Chicken Tikka, Pistachio and Cashew Korma Sauce), Subz Makhni (Seasonal Mixed Vegetable, Buttery Tomato Sauce), Yellow Daal (Yellow Lentil Stew), Steamed Rice, Naan and Tandoori Roti. I was delighted to find that none of the mains were spicy for me, though I was told that this can be changed according to your preference. 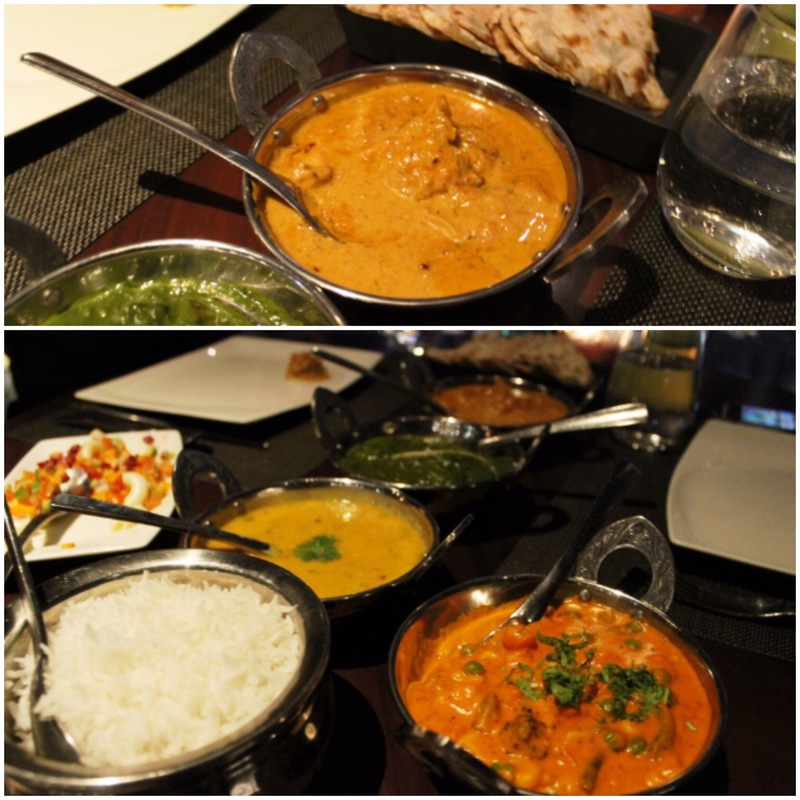 The chefs at Mint Leaf however have designed the mains menu to be non-spicy to go easy on the fasting stomach. 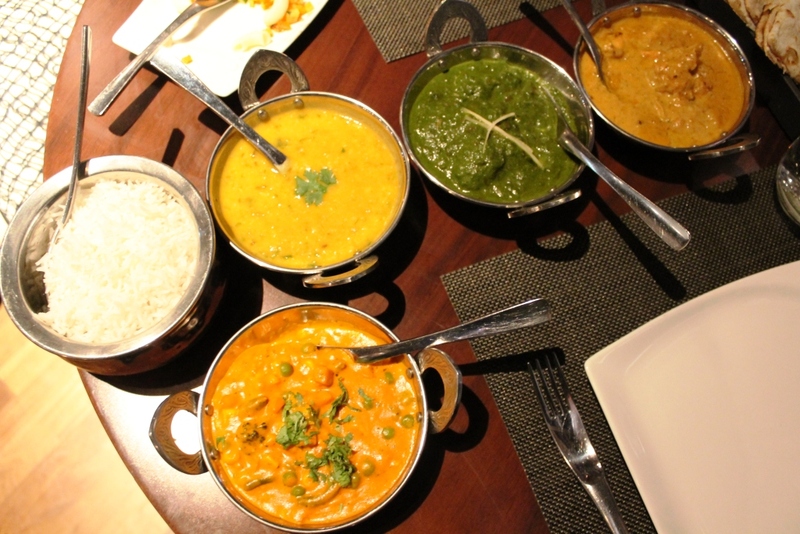 My favourite had to be the Saag Gosht, since I love a good spinach curry. All the dishes were thick and creamy, and so filling. The Roti was deliciously soft, and even the most mundane of dishes in the Indian Culture, the Yellow Daal, was flavoursome and possibly the best Daal I have ever tasted (though my mother won’t be happy to hear that!). To end the night, we were offered the Desserts. 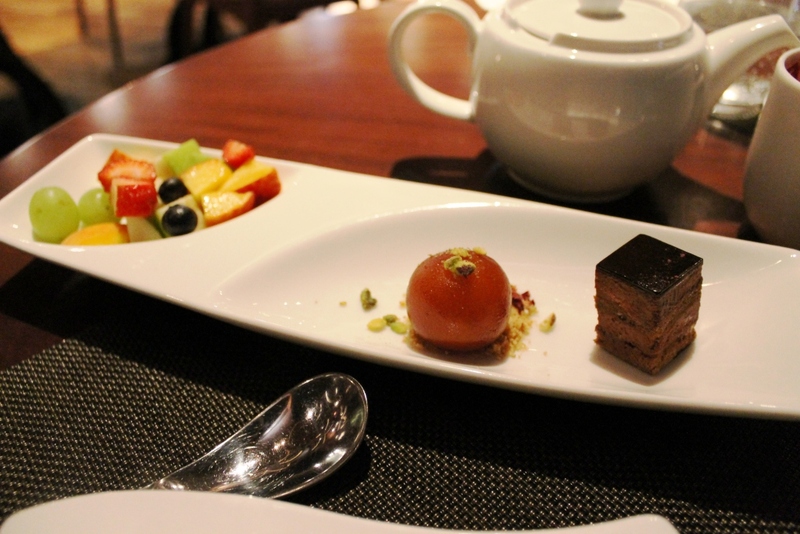 Guests during Ramadan will be able to choose from three desserts: Home Made Gulab Jamun, 70% Valrhona Chocolate Mousse and Fresh Fruit Platter. Although for a fasting person, I would recommend that you end with a plate of fresh fruit, the sweet tooth in me is always going to choose the other two desserts over the fruit. Let me not get into how hard I had to restrain myself from devouring the desserts before taking a picture, for your sake. Both the Gulab Jamun and the Chocolate Mousse were out of this world amazing. I was seriously considering stealing some from my husband’s plate, but alas he gobbled up his dessert just as quickly as me. 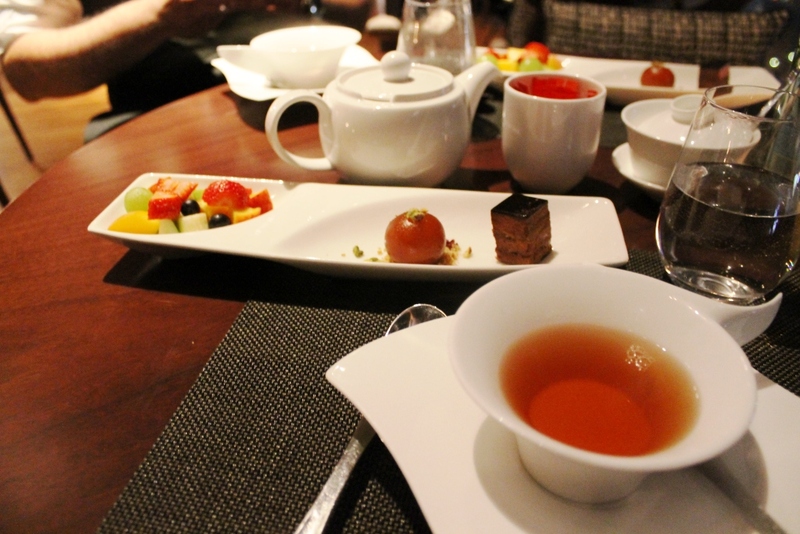 To accompany the wonderful desserts, we had a cup of Earl Grey Tea, which were served in the more gorgeous looking cups. Mr Z found it a little awkward to hold with his manly hands, but the cup fit perfectly into my tiny ones! 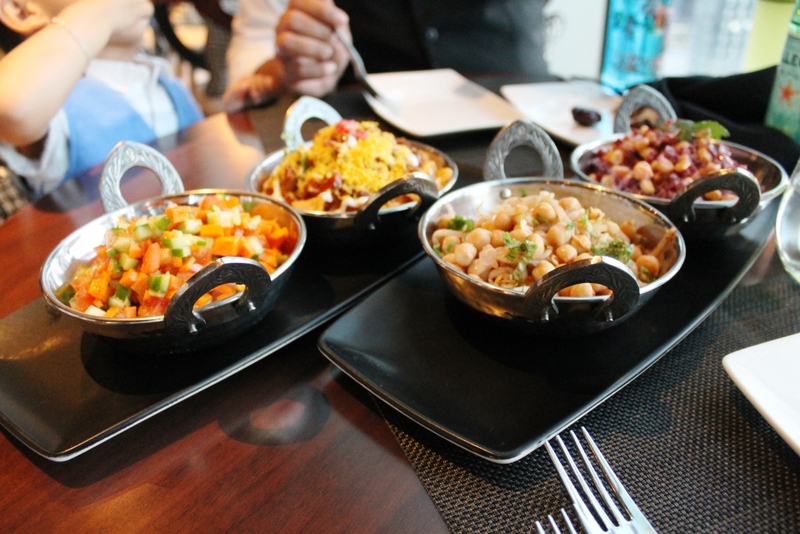 Upon inquiring about the price of the Iftar Menu, I was shocked to find that it will be priced at only AED 135. Taking in to account the food, the venue and the breath taking view, this is such an affordable price, which is exactly what Mint Leaf wanted to achieve and offer to their guests. Mint Leaf will also be offering this same menu (apart from the plate of dates and nuts) for Suhoor if you wish to come at a later time. Although the restaurant is not particularly child friendly, due to the seating arrangement around which you would not want to let your toddler loose, the staff were very endearing towards Baby Z nonetheless. 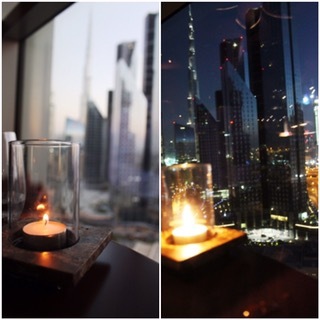 The spectacular view was also a great distraction for Baby Z as he watched the tiny cars drive by below him, whilst we enjoyed our candle lit meal. 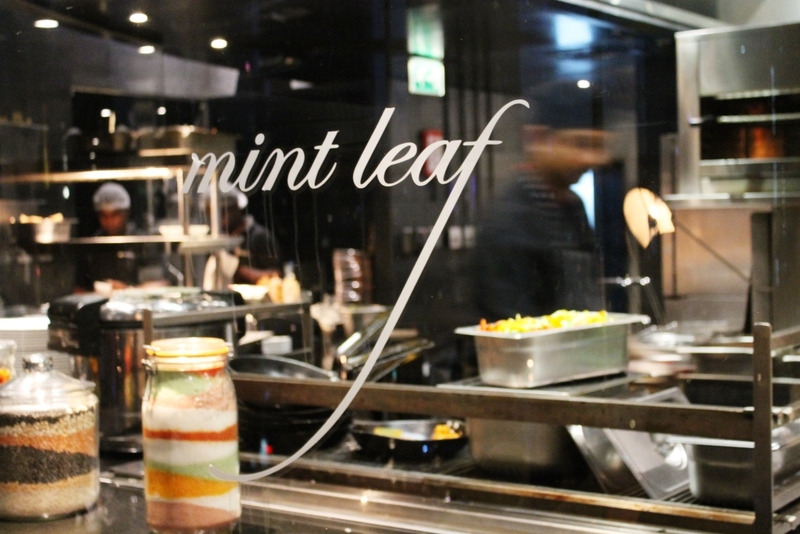 Over all, I think Iftar at Mint Leaf of London is one to be experienced for sure. It truly is a gastronomic experience not to be missed. For more information, head on over to the website of Mint Leaf, Dubai. 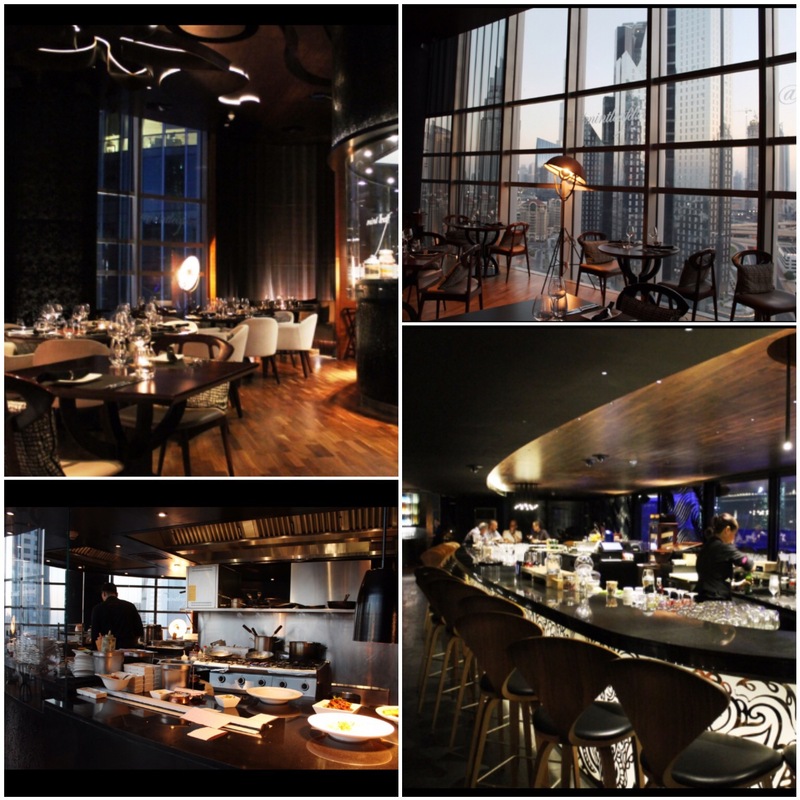 You can also stay up to date by following @mintleafdxb on Instagram, Facebook and Twitter. 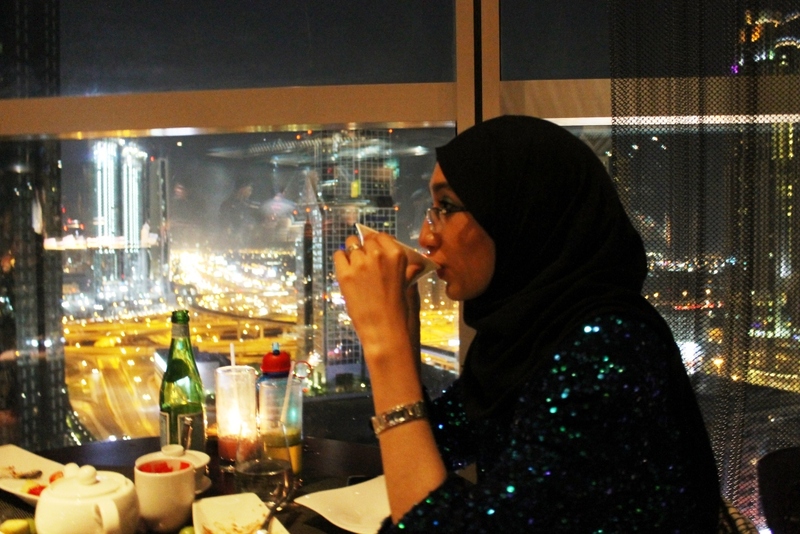 Note: We were invited to review the Iftar Menu of Mint Leaf Dubai. However, all views and opinions expressed above are honest and solely my own. It really was! Worth a visit! The food looks great! I haven’t visited them so far, but the view is so nice too. The view was what did it for us too! For the spread that they are offering – very DECENTLY priced, I must say!